HomeDestinationsWhat to expect in Alaska in September. What to expect in Alaska in September. Here is my attempt at writing a short to the point cliff notes version of what to expect in Alaska, if you do decide to take a trip there. Not that I’m a big expert in Alaska all of the sudden but I wanted to share my experience with those who wish to know. I took the trip with a friend of mine (Captain Brian Epperson) who was invited up there by one his client(Chuck), who happens to enjoy fishing in Alaska as well. I tagged along to take photos and share the experience with everyone. We did not stay at any fancy $3500.00 a week lodge. We did not have our hands held and a guided tour every where we went. Not that it’s a bad thing, just that no one offered to foot the bill. We just booked the ticket, look some stuff up on the internet, made a few phone calls and let the rest fall into places. 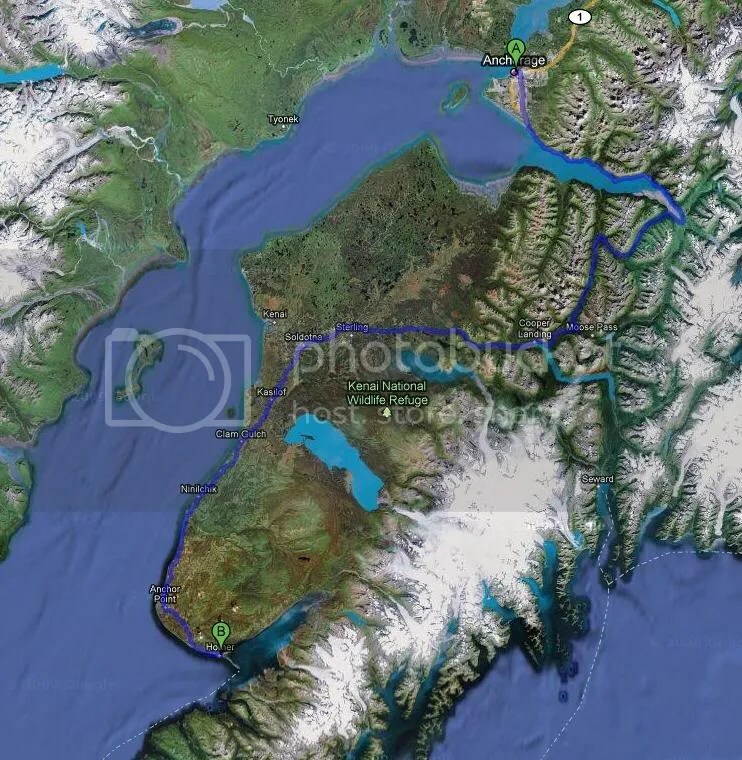 Basically we planned on flying into Anchorage Alaska and head south to meet up with Chuck(the local) and spend a couple days fishing the famous Kenai river. Then head south to do some steel head fishing and halibut fishing in Homer Alaska. The airfare was quite standard. We flew coach and the tickets were about $700.00. If we didn’t have any lay overs the flight time was about 11 hours. On our trip there we flew Tampa to Houston then to Anchorage. On the route back we flew through Minneapolis then to Tampa. The transportation once we got there couldn’t be any easier. The Alaska roads are very well maintain and looked mostly new. This time of year you don’t need anything but a regular car. We rented a medium compact which ran about $300 for the week we were there(Budget rental). The pathway from Anchorage to Homer which is about 230 miles away the roads were nicely paved and well marked. If you drive straight through it will take you about 5 1/2 hours as it is pretty winding and through a load of mountains. There are plenty to see while you’re driving as well. There are snow capped mountains, streams and lakes running along side the road ways. You will drive by many scenic over look. They are marked with a camera sign and has a nice pull over for safe parking. Note: Gas in Alaska is about $3.50 which is $1 more than it is in Florida. Yes I know they pump a bunch of oil up there but I guess they don’t’ much refineries up there. The weather for the time of year we were there were 35 degrees at night and about 50 to 60 during the day. It might sound cold but it’s actually pretty mild. The key is to dress in layers and once you get hot(yes you will get hot), you can just start taking layers off. I recommend wearing mostly fleece. It’s very warm and dries quickly if you get it wet. Do NOT wear cotton. There’s a saying “Cotton Kills” for a reason. Cotton feels great until it gets wet. Cotton is very slow to dry and at times can ice up and form an ice jacket which is very very bad. Believe or not, Alaska these days,( at least for my Verizon phone,) I has great cell service. I was able to make and receive calls pretty much the entire time. The only time I did not get service was when we hike to the Russian River falls. In Anchorage it is like any city. They have the standard stuff like Chilies, McDonald. If you’re like me I do my best to eat at the non franchise stuff. I try to eat at places that is unique to where I was traveling. I highly recommend Cafe Cups in Homer Alaska. That place was awesome. The Honey Habanero salad dressing was excellent. The seafood etouffe was phenomenal. I also had a chance to eat Caribou burgers, moose brats and Reindeer sausage links. This was not at a restaurant, Chuck’s buddy was kind enough to hook us up with some. There was not a shortage of places to stay in Alaska. It’s very much geared towards the outdoors man. There’s plenty of lodges and hotels along the way. Yes, sometimes it can be many miles between towns but once you are near one it not hard finding a place to stay. The first 2 nights we slept at the cooper’s landing campground. Being it was off season there wasn’t even a charge for camping.The campground had usable bathrooms, plenty of room for a fire pit and parking. The third and fourth night we stayed at Best Western in Homer Alaska for $89.00 with my triple A discount. This was a pleasant surprise. The rooms were clean and comfortable. The hot showers at the end of day was well worth it. The last day we stayed at Economy Suite in Anchorage. The place had plenty of room but seemed a bit run down. However for $65 it was a bargain. We checked a nice fancy hotel down the street and they wanted like $150 night. No thank you. If you forget your gear you won’t be missing out. In Anchorage there’s plenty of sportsman stores. In Anchorage, Sportsman’s warehouse is one of the bigger ones there along with Sports authority and of course Walmart. If you need gear outside of Anchorage have no fear. Pretty much all the hardware stores have fishing and hunting gear and they are pretty well stock. I mean the one we went to was better stock on fishing gear than Sports Authority in Florida. The Tru Value in Homer Alaska had waders, rods, reel, fly gear, offshore you name it. Note: I will adding more helpful information here and hope to get people planning on visiting a well rounded experience.